Having scored incredible commercial success in the late 70s with Scottish pop-punk outfit The Skids, guitarist Stuart Adamson set out in 1981 to do something new - and in the process found even more success and acclaim as leader of the hugely talented Big Country. Together with guitarist Bruce Watson, bassist Tony Butler and drummer Mark Brzezicki, Adamson lauched Big Country in April 1982 and their unique twin guitar based bagpipe sound soon brought them to the attention of Phonogram Records who issued the band's debut 45 "Harvest Home" in September of the same year. Though not a hit it did bring the band's name to a much wider audience and following gigs with the likes of The Jam and U2 they finally made the chart breakthrough in April 1983 when the stunning "Fields Of Fire (400 Miles)" made its way to No. 10 in the UK Top 40. The follow up "in A Big Country" reached No. 17 three months later and coincided with their debut UK headlining tour. Their debut album "The Crossing", which included their first two singles as well as the superb "A Thousand Stars", spent over 80 weeks in the UK charts as well as hitting the top 20's in both Canada and America. "Chance", the only ballad on the LP, gave the group a UK No. 9 hit late 1983 and was followed in early 1984 by a Top 10 placing for "Wonderland" and a Top 20 slot for "East Of Eden" whilst their second LP "Steeltown" actually entered the UK chart in the No.1 position, proof of Big Country's incredible rise in popularity amongst the nation's record buyers. Sellout gigs at venues like The Wembley Arena and Birmingham's NEC showed that they could pull in the crowds and gave the band a chance to try out cover versions such as Smokey Robinson's "Tracks Of My Tears" and The Rolling Stones' "Honky Tonk Women". Most of 1995 was spent writing the soundtrack to the "Restless Natives" film and recording their third LP "The Steer" though early 1986 saw Big Country score their biggest UK chart success when "Look Away" hit No. 7 in the Top 40. "The Seer" LP, which included the single, shot to No.2 and also spawned the band's tenth consectutive Top 30 smash "One Great Thing" though "Hold The Heart" 45 incredibly only managed to reach No. 55 at the tail end of the same year. A UK tour with David Bowie and massive outdoor concerts in Eastern Europe (including the first ever gig to a standing crowd in Russia) showed just how far the band's popularity had spread and culminated in a UK Top 10 position for the "Peace In Our Time" LP which the band officially unveiled in the unusual setting of London's Russian Embassy! However, the almost relentless world-wide touring schedule led to Brzezicki quitting in the summer of 1989 (he's now one of the world's most in demand session drummers) and he was replaced by pat Ahern who debuted on the early 1990 Top 50 hit "Save Me". The success of a "Greatest Hits" package later in the same year helped re-establish the band's sound and they fully capitalised on it by scoring a Top 30 position with the "No Place Like Home" LP as well as chalking up their 17th and 18th UK hit singles courtesy of "Republican Party Reptile" and "Beautiful People" as their hit making years moved into a second decade. 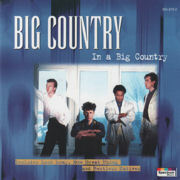 Today Big Country are still a major attraction on the live circuit and still producing consistently high quality albums, and as this 16 track collection of hits, classic album cuts and ultra rare B sides show, their Scottish rock sound still remains timeless and totally unique. Tracks 1, 2, 4, 5, 6, 7, 9, 10. 11, 13, 14, 15 & 16: EMI 10 Music Ltd. Track 3: Jobete Music (UK) Ltd. Track 8: Westminster Music Ltd. Track 12: Warner Chappell Music Ltd. This compilation Ⓟ 1995 Karussell International ©1995 Karussell International. The copyright in these sound recordings is owned by Mercury Ltd (London) and is licensed to Karussell International. A product of Karussell International. a PolyGram company. Country of manufacture as stated on label. All Rights Reserved. Unauthorised copying, hiring. renting. public performance and broadcasting prohibited. his compilation © 1995 Karussell International © 1995 Karussell International All Sighs reserved. Unauthorised Copying hiring, renting, public performance and broadcasting prohidted.